Pirates take whatever they please, whether it be ships, plunder, or people! The adventurers wake to find themselves press-ganged into the crew of the pirate ship Wormwood, the vessel of the nefarious Captain Barnabus Harrigan. They'll have to learn how to survive as pirates if they're to have any hope of weathering rough waves, brutal crew members, enemy pirates, ravenous beasts, and worse. But when fortune turns to their favour, it's up to the new crew to decide whether they'll remain the pirate's swabs or seize control and set sail for adventures all their own. "The Wormwood Mutiny," a Pathfinder RPG adventure for 1st-level characters, by Richard Pett. Details of life aboard a pirate vessel and rules for becoming the most infamous scallywag to sail the seas, by Jesse Benner, Richard Pett, and F Wesley Schneider. Revelations on the daring faith of Besmara, goddess of pirates, strife, and sea monsters, by Sean K Reynolds. 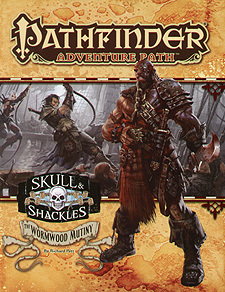 Death and plunder in the Pathfinder's Journal, by Robin D Laws. Four new monsters, by Jesse Benner, Sean K Reynolds, and Steven D Russell.